I thought I had it good cocktail-wise with Clover Club and The Jake Walk within walking distance of my apartment but it just got better. The team of Franks (Castronovo and Falcinelli) behind Frankies 457 Spuntino have collaborated again and opened Prime Meats on the corner of Court Street and Luquer Street in Carroll Gardens, Brooklyn. The restaurant is not a steak house but a tribute to an older tradition that will feature an in house butchery, home made mustard, sausages, Stumptown coffee, and a Germanic themed cuisine centered around pork. Eventually, there will be an upstairs speak easy and retail shop where one will be able to purchase the foods and other products sold at the restaurant. For now the front room bar and dining room is open for business and like Frankies, it is cash only. Standing only bar. Mustachioed bar chef. Circa 1890s vintage bar. Fresh ingredients and artisanal liquors. Uncle!! The bartender, Gabe from Weather Up, another Loungerati haunt in Prospect Heights, is all business but takes time to answer questions from newbies and old barflies alike. He helped me sample the cocktail menu and knows his stuff. -Old-Fashioned (rye whiskey & house made Bartlett pear bitters) was excellent. The Bartlett pear bitters are home made and apparently from the pear trees in the garden of Frankies 457 Spuntino. -Martinez Cocktail (gin, maraschino liquor, sweet vermouth, & aromatic bitters)is one of my favorite drinks. The original recipe of the martini's precursor is followed to the letter. Only item to note is minor, I would have preferred Bols Genever be used in lieu of Plymouth Gin because it is closer to the raw type of gin used at the cocktail's creation. -Prime Manhattan (rye whiskey, sweet vermouth, & house made Buddha's Hand bitters) was well balanced and the house made bitters complimented the Rittenhouse 100 proof bonded rye. -Applejack Sazarac (applejack, absinthe, & peychaud's bitter)was the only misstep. Applejack and Absinthe rinse? It did not sit well. In my experience, Applejack may be substituted for Rye or Bourbon in some drinks (e.g., juleps or smashes) but in drinks with complex flavor builds like a Sazarac, I prefer to keep it simple. -Aviation Cocktail (gin, maraschino liquor, creme de violette, lemon juice) - it is good to see the original recipe in use with the addition of creme de violette. -Prime Daiquiri (light rum, apple brandy, lime juice) looks like a summer drink to taste. -Loganberry Scramble (reposado tequila, loganberry liquor, lemon juice, agave syrup)is the crowd favorite according to the barkeep. I am not a big tequila fan but the loganberry liquor seems intriguing. -The Good Word (unaged corn whiskey, lemon juice, yellow Chartreuse, maraschino liquor) - a corn whiskey twist on the Last Word. -The Waterfront (Fernet Branca, Branca Menta, & ginger beer)- double Fernet Branca, I cannot wait! As mentioned, the food menu has a Germanic flavor which is perfect for strong cocktails. I started with a light dish of Landesjager (pickles, relish, and hunter's sausage - $3). Then I went right for the Sakrut Garnie (smoked pork belly, Bratwurst, Kassler, Homemade sauerkraut, and potatoes) with a side of spatzel (with gruyere cheese). I hope this place goes the way of St.John Restaurant in London for true snout to tail pig goodness. Looking forward to sampling their new brunch menu as well. 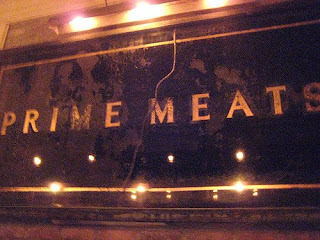 Please check out Prime Meats when you are in the hood.